The Colorado Rockies organization was altered all the way back in 2013 on April 28th. That is the date when Nolan Arenado debuted for the very first time in the big leagues for Colorado. 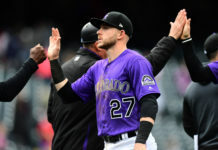 Since the realization of Arenado’s greatness, the Rockies have a bonafide superstar who is arguably the best defensive third basemen in all of baseball and their path towards contention took a massive step forward. So what exactly has Arenado accomplished in the 1828 days and five seasons since Arenado became a big leaguer? The list is staggering. While Arenado’s offensive bombardment with a bat is as impressive as any other hitter in baseball to start his career, it is his wizardry with his glove that separates him from the pack of other star players. Arenado makes plays that are so incredibly difficult that they redefine what plays can and cannot be fielded on a regular basis. What is most flabberghasting is that he makes these seemingly impossible plays while making it look easy and nonchalant. In addition to making the toughest of plays look routine, Arenado’s range is as expansive as any other hot-corner resident in all of baseball. Arenado led all of baseball in putouts from third base in 2015 and 2017. He also led the Majors in assists from third base as well as most double plays turned in 2015, 2016, and 2017. 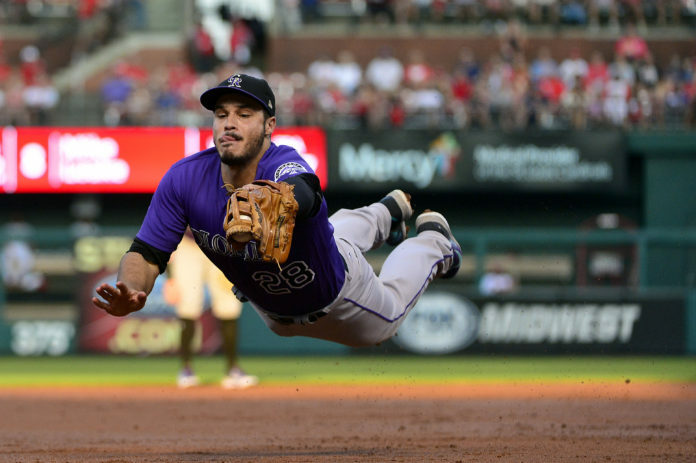 Arenado has the highest fielding percentage of all active third basemen at 97.1 percent and also leads all of baseball in games played at third base over the course of the past three seasons. Arenado’s production and effectiveness in the hot corner have truly been a sight to behold over his first five seasons and he continually gets better and better. The first five years of Arenado in a Rockies uniform have been nearly preposterous, so who knows what he has in store for his next five years. One thing is for sure; Arenado will keep showing the world that he is among the best hitters in the world while also being a magician at third base.